At one time collecting was a simple pastime ! Collecting per the catalogue is probably easier - and use of quadrille pages can hide gaps as well as allowing the collector to chose his/her own layout. I’m not sure whether it is SG or Davo who determine what goes in the album, but better consistency would be helpful. Davo determine what is in the album. But this - and your expansion of it - explains why there is low demand for some of the catalogued stamps. My contact at SG thought the album was in line with CBS, rather than with the Concise. I'll have to invite contributions from Lighthouse and other album users. As you rightly point out, the SG Luxury Album is apparently based on CBS, but I still have a list of stamps from there that are not included! Further to my post at 09:21, herewith the response from SG. Interesting that you are talking about the Stanley Gibbons Deluxe album supplement pages.... it's seems DAVO (which I purchase here in Holland) follow exactly the same page layouts. I wonder who pinches what from whom? And nope - I didn't fall into the trap of your customer simply because I tend to mount singles from a mini-sheet on the opposite page from where the mini-sheet is mounted.... no confusion there.... plus the fact that I had purchased the PSB panes specially for the album and could only match up 5 to the printed pictures and then went searching for where I should store the other 3 gummed stamps. I admit I thought it odd at the time but haven't thought about it since until I read this blog! And no - the pre-printed supplement pages don't nor will ever cater for ALL issues and varieties which is why I resorted to purchasing plain DAVO pages - exact layout with a black border and exact sizing as the normal supplement pages but I get to play with what and how I want to mount all the extra's.... For instance - I have one page per year with all the varieties of NVI Security Machins which I pop into my albums at the end of each year (usually immediately after the Christmas issue) It does mean that I probably need more space than DAVO suggests (1840-1970 Davo I, 1971-1989 Davo II etc etc). The first couple of binders are OK but things start getting tight from binder III onwards. To ease the squeeze I invested in 2 empty Davo VII binders this year (I have separate MNH and FU collections) and will segregate my existing albums from III on so that there is more room for extra's. What I do find a shame but would take up even more space in a binder is the fact that Davo don't pre-print extra pages for GB single stamps when the issue is pairs or strips of 3, 5 or 6. 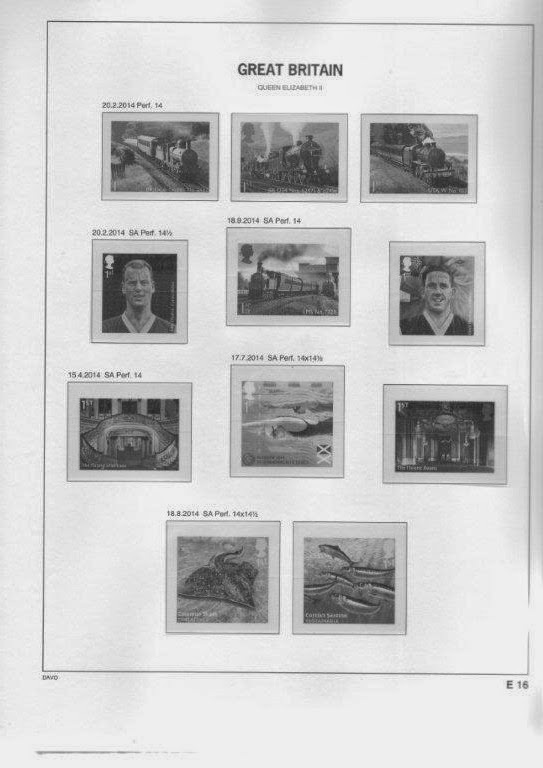 The Dutch Davo albums can supply pre-printed pages for their singles of sheets of 10 stamps. I've sometimes had problems with the Hawid mounts catching on each other unless I put either tissue paper or even a sheet of A4 paper between. If possible I will try to add 'extra's' to the same page as the pre-printed. Oh and can I list another issue which is from the 2015 Star Wars PSB. SG Concise list these as 2nd issue. And yes, I purchased two of the panes but now have nowhere to store them unless I use my own invention of an extra blank Davo page. I have to admit that to my tired old eyes the actual stamps look exactly the same as those from the mini-sheet but perforations are meant to be different. I'll need to get my loop out to confirm. And glad I'm not the only one with PSB Machins not yet stored in the albums although I was recently thinking about just adding them to the relevant pages with the Commemorative issues. Either that or stick in a few extra Hawid mounts onto the pages with the yearly Machins (more room!!) I've done just that with the QEII violet Machins with different codes and made a little group of them on the page which Davo designated just one. And my soon to be next project is to use blank pages to store the yearly coded regular Security Machins (1p, 2p, etc etc) which will again have a place for themselves probably one page ahead of the NVI Machins. If things haven't been pre-chewed and thought out by those bods publishing album pages then we will have to figure things out for ourselves and, if necessary, re-invent the wheel!! After a couple of years away from working on my collection and recently trying to update it, I still find myself confused with the above mentioned issues. I gave up on the SG Windsor album a few years ago for basically the same reasons. Deciding to purchase the Davo Luxury albums (7 vols). It appears to me that the spaces allotted to each stamp are done so in date of issue order but I have come across several omissions (added later) from past supplements, quite a few being machins. Also of late I have tried to obtain what we (in UK) term index pages, as a couple of mine appear to contain "out of sequence sg numbers"). Each time I input a search on the Davo Nl site for index pages, nothing appears other than supplement pages. I normally purchase direct from Davo as I find it cheaper to do so, on a budget. I now have numerous correct cat numbers pencilled into indexes and various other pages of my albums, which spoils the layout. Having recently purchased the 2015 & 2016 supplements, unless I've overlooked something there appears to be no mention of any regionals issued. Still updating? ?